A perfect start to the season for West Michigan (16-15) lefty Matt Hall (4-0, 0.83 ERA) earned him the nod to take the hill against the visiting Fort Wayne TinCaps (18-16) for the start of a four-game home stand at Fifth Third Ballpark. Relying on a filthy curve, Hall locked in quickly, working a dominant five scoreless innings of work for West Michigan, holding Fort Wayne to just a pair of hits and fanning eight. Offensively, West Michigan set the tone early, facing Fort Wayne lefthander Logan Allen (2-2, 2.74 ERA). 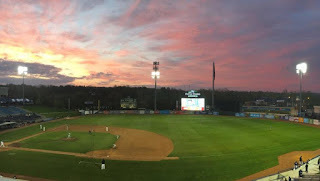 The Whitecaps struck first, scoring off a sacrifice fly from Will Allen at the bottom of the first, followed up with an RBI double from West Michigan outfielder Jose Azocar. Shane Zeile added the third run of the outing, scoring Azocar off a sharp single. Coming in to relieve Matt Hall, West Michigan righty Jon Maciel (2-1, 7.31 ERA) surrendered the first runs to Fort Wayne off a pair of RBI singles to Brad Zunica and San Diego Padres number nine prospect Michael Gettys at the top of the sixth inning. That was all the offense the TinCaps would see. A few wild pitches from the Fort Wayne staff, combined with an RBI single from Will Maddox at the bottom of the eighth extended West Michigan's lead. Flame throwing West Michigan closer Gerson Moreno (1.69 ERA) tossed just 15 pitches, shutting the door on Fort Wayne with a sizzling 99 mile-per-hour fastball to give West Michigan the series opener at Fifth Third Ballpark, earning his fourth save on the year. Matt Hall fell one strikeout short of tying a career-best in strikeouts, since joining the Tigers minor league organization as their sixth round selection in 2015. Hall struck out nine on April 16 against the Dayton Dragons in 6 2/3 innings for West Michigan. In relief, Jon Maciel struggled to hold Fort Wayne at bay, allowing the TinCaps to break the shutout with a pair of runs surrendered following his entrance in the sixth. Coming up next: Fort Wayne returns to West Michigan Friday night for the second frame of the four-game Whitecaps home stand. Game time is slated for 7:00 pm at Fifth Third Ballpark.